The gas density transmitter is electronically compensated. The compensation follows the nonlinear behavior of SF6 gas. The basic principle is the calculation following virial equation. The gas density transmitter picks up the physical variables pressure and temperature of the SF6 gas contained in the device (tank). The current gas density is ascertained from both variables by means of an electronic evaluation system. Thermal induced pressure changes are dynamically compensated and do not affect the output signal. 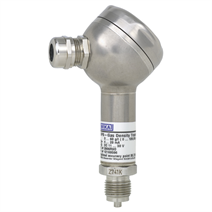 The gas density transmitter generates a density proportional, standardized signal of 4 ... 20 mA. A recalibration of the zero signal as well as maintenance service will no longer be necessary due to the high long-term stability of the gas density transmitter. As a standard, wetted parts are made of stainless steel. The hermetically welded measuring cell guarantees high long-term tightness. The specific structure of the measuring cell requires absolutely no internal sealing elements so that any leakage of the instruments can be excluded. Due to these features the gas density transmitter is also independent of atmospheric pressure fluctuations and variations of the mounting height.